There are times when you need to capture an event, but you can’t spare the time to be there every day. If you can place your camera in a secure location, you can use GBTimelapse to capture the images automatically. 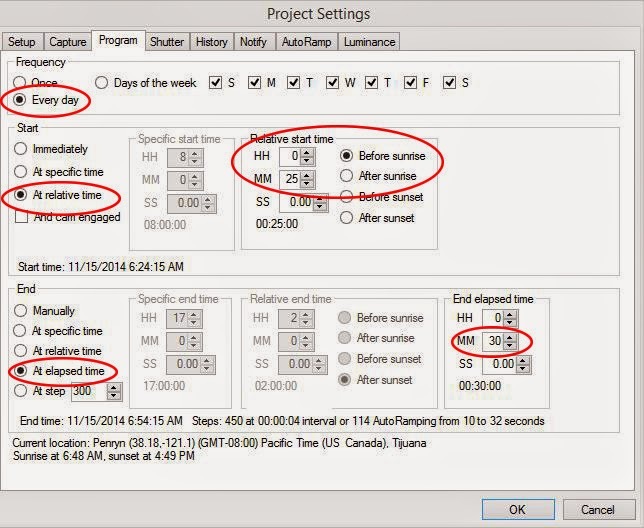 It can start and stop at set times each day and automatically adjust the exposure for flicker-free capture. 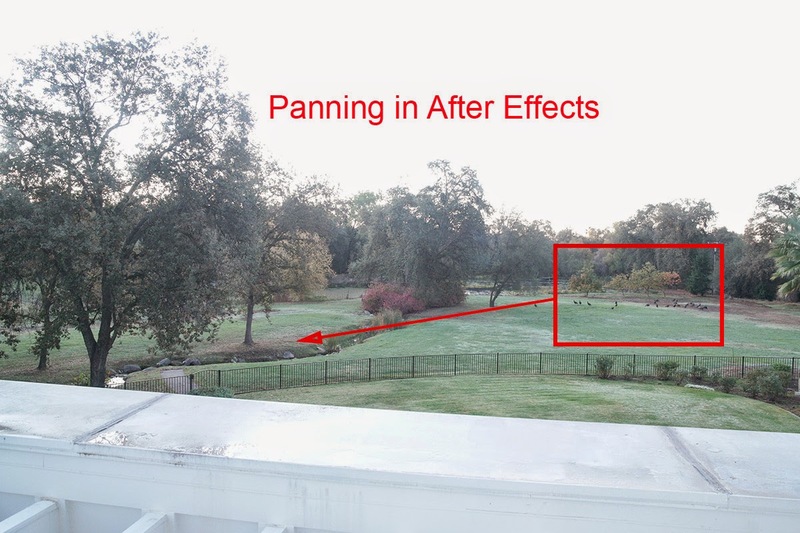 Here’s a behind the scenes look at how I used GBTimelapse to capture the daily “Wild Turkey Parade“ across our property. I placed a camera in an upstairs window with a view of the turkey’s daily route. I used a Bower 24mm manual lens with the aperture constant at f/5.6 to prevent any aperture flicker and I draped the back of the camera with a black cloth to block any window reflections. I needed a wide angle lens to cover the unpredictable turkey wandering, but the full wide angle image included a bright sky and foreground. To get the correct exposure in the middle ground, I used GBTimelapse’ new luminance region option. 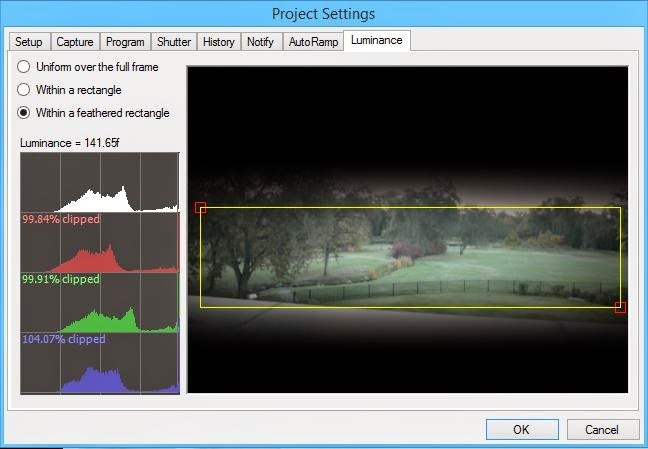 Instead of calculating the histogram over the full frame, you can specify an arbitrary sub-rectangle for the histogram. Here you can see the region I set to eliminate the sky and foreground. This guaranteed a proper exposure of the middle ground regardless of how bright the sky was. Because I was capturing large/fine jpegs with at 5760x3840, I was able to crop down to 1280x720 in After Effects and pan as the turkeys wandered across the full frame. The turkeys start their parade just before dawn, but the sunrise time changes rapidly in the fall at this latitude. So, I set the GBTimelapse program to start every day at 25 minutes before dawn and to run for 30 minutes. My initial exposure at that time before sunrise was about 2 seconds, f/5.6 and ISO 100. Each day was different because of the different cloud cover and lighting, but GBTimelapse AutoRamp would settle on a good exposure in just a few frames. By using bulb mode, I was guaranteed to get smooth exposure changes with no Tv stepping as the scene brightened by more than 4 f-stops over the 30-minute period. 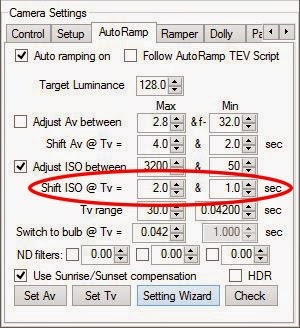 I set the GBTimelapse AutoRamp parameters to keep the bulb time between 1 and 2 seconds. Each time GBTimelapse adjusted the bulb time down to 1 second, it would halve the ISO and double the bulb time back to 2 seconds. A 4 second interval with a 2 second exposure gave a nice “180 degree shutter” look to the video instead of the choppy look from a shorter exposure. This may not be the most interesting video, but the techniques I used are very powerful! For our professional clients...the ability to run automatically can greatly increase your productivity. You should consider it the next time you can place a camera in a secure location.